When I’m heading off on a summer holiday the very first thing I pack is the pile of books I want to read. On a recent trip with my husband I was horrified to discover that the book he was taking with him was A Natural History of Latin. Now I am sure that this is a very worthy tome and he tells me that what he has read so far has been most interesting, but I believe that such a book should not be taken on a short stay at the beach. You need a very different sort of book for this type of holiday, one that can cope with many interruptions (after all our utterly gorgeous granddaughter was with us), one that can be nodded over when you’ve returned from sun and seawater, and one that is light, absorbing and fun. I did my very best to persuade him that something else would be infinitely better – I even offered to find a nice selection for him, but NO, I was told firmly that if he was going to read anything, it had to be the Latin book. My favourite beach reading is a crime novel – a proper beginning, middle and end, plenty of action, yet I don’t need to concentrate too hard – pure escapism and enjoyment. Of course, a lot can depend on the length of the holiday – after a week of escapist literature, I’m usually ready to move on to something a little more challenging (one beach holiday in New Zealand was memorable for being hugely enriched by Richard Holmes’s superb biography of the poet Shelley – there is still sand in its pages to remind me). But I only truly feel a holiday has started when I open a good murder mystery, hear the waves lapping as I read, and feel my body and mind relax. On this recent trip, my Dad lay happily on one couch reading his Scandi crime, my son chuckled over a very light-hearted travel book, my daughter had her chick-lit novel but, as I had known would be the case, A Natural History of Latin never emerged from the suitcase. 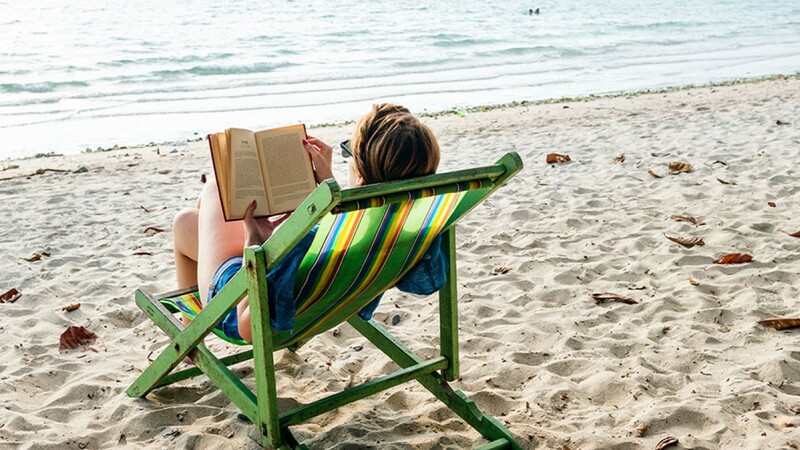 What do you think is the ideal book for a beach holiday? I’d love to hear your suggestions so please leave a comment. Thank you Susannah for the details of A Natural History of Latin. I am always looking for a quirky birthday present for my husband. He is always telling me about the value of studying Latin. Thus book will be perfect ! I am glad I gave you an idea. Shopping for husbands can be so hard. I just hope your husband reads it – mine has not turned a page since well before the holiday I mentioned. I read Georgette Heyers “Venetia” on my beach holiday at Newport with Cathy! Perfect! I am taking Jo Penglase’s advice to re-read her books as an adult, having loved the ones I read as a teenager. Getting so much more out of her delightful wit, use of language and period detail now, as well as wallowing once more in the romantic doings of her feisty heroines and dashing heroes! Have just got hold of one of her detective stories in preparation for the coming conference. Ha!This reminded me of our last trip to England. We each chose a book at the airport for the long journey ahead. Me – a fast moving crime novel. My gorgeous late husband – The History of Scurvy! My recommendation is A J Finn’s The Woman in the Window – loved it. A great thriller with lots of twists and turns. Good grief, The History of Scurvy!!! I think I will stick with your recommendation – thanks. I read, upon recommendation, The Radio Girls by Sarah-Jane Stratford which turned out to be a page turner. Set in London 1926, the novel is woven around a true woman, Hilda Matheson who worked for MI5 during WW1 and afterwards became political secretary to Lady Astor. She then was appointed Director of Talks at the BBC. The plot of the novel is fictional but does make for a good holiday read. Oh that does sound intriguing. I loved the series on TV The Bletchley Circle, and it sounds rather similar. Thanks for such a nice recommendation. Thank you Sussanah and others for your reading suggestions – always on the look out for a new title or ten, holidays or not! I recommend an excellently researched crime/thriller series set in medieval England by C.J. Sansom. The first is Dissolution (Mr.Google has more information). Robert Galbraith (alias J.K. Rowling)has written a crime series around activities of private detective C. Strike – the first is The Cuckoo’s Calling. I hope you enjoy these. In my January edition of ‘Notes from a Book Addict’ I wrote about my passion for the CJ Sansom novels. I have read all of them and am so terribly upset that he has terminal cancer and so there will be no more. I have also many months ago now written about the Cormoran Strike novels, which I have also really enjoyed. Have you seen the film versions. I loved the casting of the two main characters and do hope they make more. Thanks for the recommendations, but we are clearly already on the same wavelength. I have just finished reading Patrick Dewitt’s new novel “Paris Exit”. The plot was utterly absurd but I thought the style was brilliant. I am now reading a very different one of his The Sisters Brothers”which I am also enjoying. I read “Tombland” and was impressed by the accurate historical background but thought it dragged a bit in the middle. I must admit I prefer Hilary Mantel. I have never heard of Patrick Dewitt – another author to add to me ever-lengthening list! Did you read the other Shardlake novels, or only Tombland? You really need to read the whole series. Holiday reading must always be light! I never go away without a good, cosy mystery or comedy. Last week was spent riverside with my first Georgette Heyer mystery. Perfect for my surrounds! Gorgeous! Have you thought of coming to the Georgette Heyer conference to be held in Sydney on Sat. 2 March, cost $65. There will be a talk on the mystery novels and it all promises to be a fabulous day. Let me know if you need booking details. Thank you for your most interesting blog and your wonderful lectures. I attend as many as I can. I ALWAYS take any of my beloved Barbara Pym novels. I am a Barbara Pym “tragic” and would love you to include her in your blog or ideally one of your future lectures. I have somehow never fallen in love with Pm’s novels and yet so many of my good friends adore them. I need to give her another try, perhaps in an audio version. Which is your favourite? I am delighted you love my newsletter and lectures – many thanks. I think that any of the Maigret books by Simenon are perfect for a holiday whether on a beachside holiday or one anywhere else. They are not long books and two or even three or more can be read over a week or two. I find them perfect for bedtime reading. To my shame, I have to admit I have never read an Inspector Maigret novel. I must add them to my list. I totally agree with light and crime drama (not too murderous) and or fun for holiday reading. This January I read ‘A Well-Behaved Woman’ by Therese Anne Fowler. Novel based on the life of the very real Alva Vanderbilt. Fascinating. Also read, ‘The Lost Man” by Jane Harper for my mystery. Oh boy was that a ‘can’t put it down’ read that educated me about life in remote central Australian cattle stations. Recently finished Beneath a Scarlet Sky by Mark Sullivan, and could barely stop for work and sleep!! Fascinating. One of my favorite beach reads was The Secret Keeper by Kate Morton. Beneath a Scarlet Sky sounds an ideal read for a plane flight or holiday – many thanks for the recommendation. Have you read any of the Louise Penny crime novels. The first one is called Still Life and is beautifully written and all centred around a small village called Three Pines in Canada. The characters start feeling like friends. I just love her and also read her blog, she sounds such a warm and lovely woman. I have read only the first one of hers and enjoyed it, so more are on the list. I’ll have a look at her blog – thanks for letting me know about it.